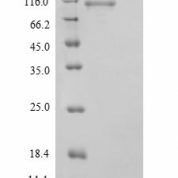 General Description of Recombinant Human STAT3 Protein. Signal transducer and transcription activator that mediates cellular responses to interleukins, KITLG/SCF and other growth factors. May mediate cellular responses to activated FGFR1, FGFR2, FGFR3 and FGFR4. 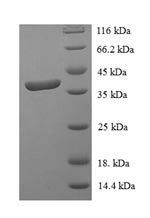 Binds to the interleukin-6 (IL-6)-responsive elents identified in the promoters of various acute-phase protein genes. Activated by IL31 through IL31RA. Cytoplasmic domain STAT3 represses macroautophagy by inhibiting EIF2AK2/PKR activity. Plays an important role in host defense in methicillin-resistant S.aureus lung infection by regulating the expression of the antimicrobial lectin REG3G . Host: QP6735 protein expressed in E. coli. Protein Construction: A DNA sequence encoding the Homo sapiens (Human) STAT3, was expressed in the hosts and tags indicated. Please select your host/tag option, above. Application Notes: Please contact us for application specific information for QP6735.